The death of former Health Minister Manto Tshabalala-Msimang marks the end of an era - a period which many South Africans feel deeply embarrassed about. Without doubt, Dr Tshabalala-Msimang was a brave liberation fighter, a deeply loyal comrade in the ruling ANC, and a woman with a formidable intellect. But sadly the world is likely to remember her for her for just one thing - her Aids policy. It was June 2000 when she gained international prominence. I was then the BBC's health correspondent and was sent to Durban to cover Africa's first ever international Aids conference. It was a hugely significant affair, coming hard on the heels of the particularly gruesome murder of a 36-year-old woman Gugu Dlamini, set upon by her neighbours after she declared she had the Aids virus. Durban was bristling with energy and anger. Most of it was directed at South Africa's health minister, who though polite and almost maternal during interviews, was frostily steadfast in her dismissal of anti-retroviral drugs, which reduce the effects of Aids. This was at the time when new medical breakthroughs offered hope to the millions of people affected by HIV and Aids. Many of the activists who protested at that conference are dead now. They passed away before South Africa revised its policy Aids drugs. Those that survived are now counting the cost of what they see as "wasted years". In early 2000 people started to use the words "Aids denialism" in South Africa. It reflected the position of the then President Thabo Mbeki, who dismissed the link between HIV and Aids and questioned the value of anti-retroviral drugs. This position became deeply entrenched in the health department, blurring the edges between politics and science. It caused international consternation the likes of which had never been seen before. "It was clear that the president was behind her and he wanted an African solution to this problem," says Treatment Action Campaign (TAC) head Vuyiseka Dubula. "So there were politics behind her stance, but after all she was a doctor, she was a scientist. She knew better that evidence counts more than politics." 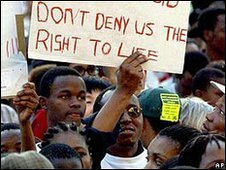 In February 2003 some 20,000 Aids activists marched on parliament in Cape Town, demanding access to anti-retroviral drugs. By the end of that year they had forced the government's hand. Those protests, along with a series of high-profile court challenges by the TAC, re-shaped the landscape of Aids policy in South Africa - beginning with the rolling out of anti-retroviral drugs. Patients could only get medicines from a limited number of licensed practitioners, and those in rural areas found themselves disadvantaged and encouraged to turn to "alternative methods" instead. As the years moved on, the mood of defiance remained and the protests against the woman the press were now calling the Dr Beetroot (because of her favouring of traditional remedies) continued. In September 2008, when caretaker President Kgalema Motlanthe dumped Dr Tshabalala-Msimang as heath minister in favour of Barbara Hogan, Aids campaigners partied outside parliament and serenaded the incoming minister, despite the rain. Dr Tshabalala-Msimang was said to be furious but nevertheless retained her position in the powerful National Executive Committee of the ANC. 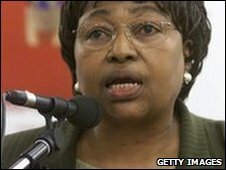 While her liberation credentials were still intact, a study last year claimed that more than 300,000 people had died prematurely because of the delay in rolling out the drugs to people with HIV between 2000 and 2005 - the time she was health minister. Jack Lewis, from the Community Media Trust, an organisation which promotes Aids awareness are, in two minds about her legacy. "There's a negative legacy and a lot of baggage that will be carried into the future," he says. While not wishing to celebrate the death of an individual, he says that the "enduring legacy of stigma and denial persist". "Its going to take at least another five years to turn things around," he suggests. Professors, university lecturers, township dwellers and young gay men are among the friends he lost in the late 1990s because of South Africa's policy on Aids drugs, he says. Talk to people on any street here and they will have a similar story to tell. President Jacob Zuma may be setting the pace with a promise to get Aids drugs to 80% of those that need them by 2011. But that target is almost double the number of people who currently receive them. Given the stalling of the past, some doubt whether that is realistic.